The Necroa Virus is a special plague type available through in-app purchases in Plague Inc. It's one of the best plagues, in my opinion, since it lets you simulate a zombie apocalypse. Necroa Virus has a completely different transmission, symptom, and ability tree compared to the basic plague types. One particular ability lets you gather a horde of zombies and send them to neighboring countries. This becomes amazingly useful if you find yourself having a hard time infecting island countries such as Greenland and Madagascar. Although this plague lets you simulate a zombie apocalypse, you do not start a game with a walking dead. Instead, the plague starts out as a virus and lets you evolve a symptom that turns humans into cannibalistic monsters. There many different strategies that you can do to beat Necroa Virus. Many strategies utilize the availability of zombies since these "things" are immune to the cure made by the world. They may be immune to the cure but the world will still fight against them through Z-Com. Z-Com is an anti-zombie organization that automatically sets a base in a country to fight off zombie hordes. The strategy I will be using will utilize the living dead. My strategy is geared towards infecting every country possible before a symptom is mutated. I do this because using the Necroa Virus' ability to move zombie hordes doesn't really appeal to me. I only tend to use it on emergency situations. In case you haven't noticed yet, one gene has been replaced by a Necroa Virus exclusive gene. 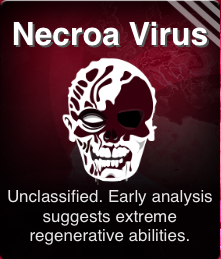 Like other genes, they are unlocked by beating plague types, in this case Necroa Virus. Assuming you just started playing Necroa Virus I will not be using these exclusive genes. If you're itching to start then read on. 3.) This part requires you to be really patient. Wait for a symptom to mutate, there are only two possible symptoms that will show up, Insomnia or Hyper Salivation. After evolving Cytopathic Reanimation, zombies should now start appearing all over the world. At this point, you don't even have to worry about some silly cure, Z-Com is your enemy now. You don't really have to get all symptoms mentioned above, especially if you chose to evolve Horde Instict. This is just the order I prefer to evolve symptoms since this makes zombies have combat advantages and added strength. I had some troubles in the second game since Z-Com established a base at Greenland and I waited too long to evolve Horde Instinct. Their base became strong enough the I needed to get additional abilities for my zombie army. So that does it. I hope this guide has helped you beat Necroa Virus. If you have any questions, some tips and strategies, or just want to say some stuff go comment below. I'll be sure to include any good tips and strategies along with this guide. Happy Gaming! I've been having issues with this one. I've tried your strategy and many others multiple times each, but none of them seem to work. I always get down to the very last country left to kill off, but then my last zombie dies. Any advice? I may be a little late but you did you sent the Zombie Hordes to Countries? It is very heavily dependent on if a symptoms evolves. The damn Icure happened adn nothing evolved I waited it out but by they cured me before anything happened. I had the points I could have just started to burst evolve but you said to be patient. Dosent work the cure already finished before any symptoms mutated.. It don't know what to do. I followed your guide, it didn't work, I followed other guides, they didn't work too. Z-com grows up too fast, even with the Horde Instinct, I always lose because of this. I think it's also worth mentioning that the Necroa Virus guides I've made are for the mobile version of the game, specifically the iOS mobile version. I tried to begin in Egypt. And I got 5 biohazards, with 180260 points. It takes a hell of time, but it solves the problem. I began with Metabolic Hijack, Creationist, Teracyte and Xerophile. This worked for Android, useless on Evolved. Dunno what they did to Z-com, it's plain stupid how strong they are even with pumped up zombies. Creationist pretty much stops you from evolving automatically. I waited until I had over 99 DNA points, and 6 mil people infected; still no auto-mutation. So I just bought the cheapest skill, which is Insomnia, and followed the rest of the instructions. Z-Com was in Libra, but the zombies took over them. Great on normal, on Brutal for me at least, Z-Com got like four bases set up and I was barely getting DNA points, I was so screwed. You could try this mega-brutal guide for Necroa for Brutal difficulty. On Brutal my best score so far is 509 days 29% Cure. This only scored me 2 Biohazards however :( (I was playing Volcanic Ash and this is the only plague I haven't done 3 score yet!) This plague is incredibly difficult to get 3 biohazards and whitout it 3 of the achievements will elude us forever. Does anybody has any working strategy that nets 3 Biohazards on Brutal? The first time I tried this, symptom mutation happened with only about 2 billion infected and Z-Com ended up defeating me. I tried again though, and it didn't mutate until there were about 6.7 billion infected, but it took a LOT of patience, like you said. 2019 days, 14%, 5/5, 368540. Didn't work for me. Tried 6 times. With this strategy I was getting to around 3 billion infected, less than half the world, when the symptoms evolved, despite using Creationist gene. If the symptom wasn't devolved it would be noticed immediately & be cured in a matter of days. The other issue was infecting Greenland & Iceland. Without evolving Cold Resistance I & II it took around 6 months game time to infect 1 or 2 people. Along with symptoms evolving and needing to be devolved and the Cold Resistance there is not enough DNA to evolve symptoms to activate the Cytopathic Reanimation once there's no healthy people left. Again, waiting until everyone was infected and evolving each symptom one at a time meant as soon as one symptom was detected a cure was a matter of days away, not leaving enough time for Cytopathic Reanimation. This strategy gets a thumbs down from me, sorry. Worked for me in 920 days on Brutal. I made a few small changes: I didn't go Creationist and I developed a couple more transmissions to allow it to spread faster and get free mutations. Main idea still the same, spread under the radar, then get zombies and strong zombies in big fast bursts of spending. I got so close and yet failed again. Here's where I failed. So I followed your above guide to the T and I mean to the T. So ZCom sets up a base in Sweden and I sent millions of zombies to destroy it. Bwahahahahaha yeah right. I had to send 10 groups of millions of zombies and even that wasn't enough and by that time it was all I could do to try to destroy the other 2 that they set up. I think that the devs need to seriously rethink ZCom or tweak it down a bit because this is ridiculous. I love a challenge, but when I want to pull my hair out in frustration and fury because all my DNA is being spent trying to keep the guys from killing me uterally then it's not fun anymore. I have completed..but i can play the simian Flu...they say when you completa the necroa virus in brutal the simian Flu JS unlock..somebody can help me? Followed your strategy fully, got 1217 days; 5/5 biohazards, %23 cure and 147260 score. You're awesome!!!! this doesn't work at all! Whoever read this: don't waste your time trying this! Yeah this strategy didn't even work on normal, let alone brutal. (IPhone) I can't use the horde ability, I try to drag it but all it does is pop up the screen that tells me how to use the ability and what it does. HELP! Third game I started in India again and....wtf, 55,000,000 of Hindus without weapon (there was no Z-com project established) killed 700,000,000 zombies with all the right side modifications...that means, one Indian person with pitchfork killed 13 "to kill and survive" modified zombies...they are fcking Gods! Fourth game lost by greenland, first infected person died immedeatelly and Z-com did the rest. I'm having symptoms mutate at 1.5 billion people infected. The closest it got to 5.5 is when one symptom mutated at 5 billion people infected. and even then I wasn't able to win because Z-Com decided to set up base in Greenland. I don't have an iphone either so I'm not quite sure why this strategy isn't working for me, but it's getting a bit frustrating when symptoms mutate before even 2.0 billion people are infected, making it impossible to let it fully spread. The entire planet is infected and I still haven't gotten a mutation yet. What the devil is this witchcraft? it worked for me even if I didn't have metabolic hijack and extremophile but wathever. Try using a stylus. or if you don't have one, then rubberband a piece of paper around the tip and use that. my fingers are pretty big, and that sometimes happens. you might not be clicking in the right spot. What???!!! How did you get 20k days? how long did that take? My playthrough on MegaBrutal. I got 4/5 Biohazards. after a while, spicy's necroa scenarios - brutal or mega brutal all worked (for me) after some trial and error... even on P.I. evolved it was a succsess. be sure to be 100% effective, evolve stuff as soon as You got the DNA. and also in some cases, You need to change strategy a bit, or start once more if there's any bad luck etc... necroa on brutal or mega brutal is the hardest one of all, IMHO. Current Site Discussion - A lot of stuff. Click here and help! Want to write stuff about games? Then join our team, write whatever you want with little limitations. Send a sample of your work to yoitsspicy@yahoo.com.ph now! Any Broken links you've spotted? Let us know! Send us an email so we could fix it immediately. About Us | Contact Us | Disclaimer | Advertise | Help Us Grow! © 2014 copyright by Yo It's Spicy Team. Powered by Blogger.